Premium quality, individually-handled, consistent with MS-67+ grade. Bead-blasting and burnishing after over-striking to produce a matte proof finish. Some evidence of underlying host coin design will likely show somewhere, such as forehead, front of neck, back of neck, and/or Eagle's shoulder. Housed in a non-PVC "flip" holder with certificate indicating "Die Pair 6, Sandblast Matte". Final mintage (of all issues combined) will be 1,964. 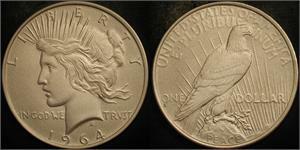 The 1964-D Peace silver dollar is one of the most enigmatic coins in history. 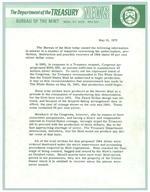 On August 3 1964 legislation was enacted authorizing 45 million new silver dollars to be coined. 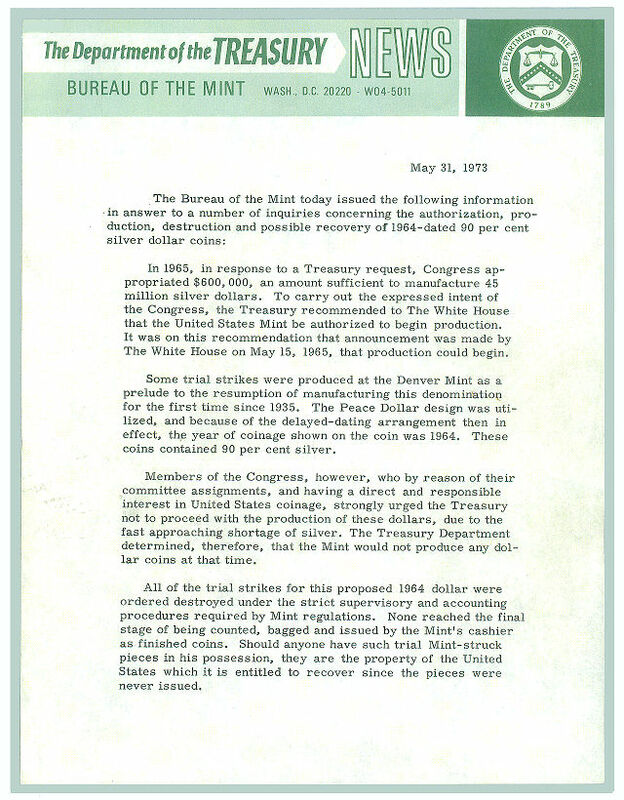 In May 1965 the White House finally ordered some to be produced and the Denver Mint soon minted 316,076 of the coins which carried a 1964 date and a design identical to the Peace silver dollar last minted from 1921-1935. Shortly after the first mintage, an order went out to destroy them. The Treasury Department claims every one was accounted for and melted. None have publicly surfaced in the 45 years since. 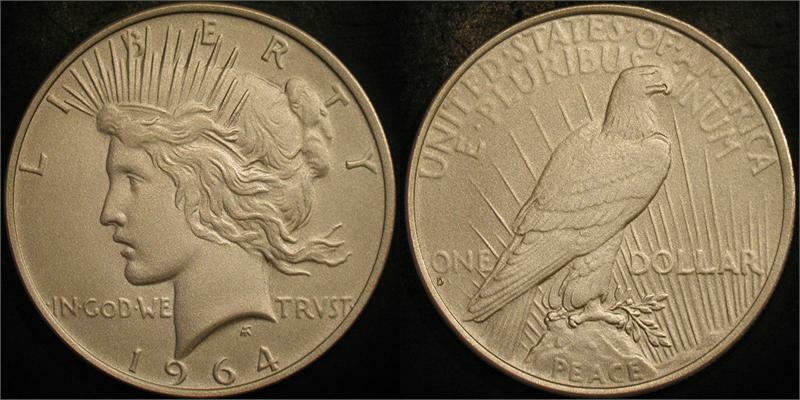 If an original 1964 Peace silver dollar were to turn up, it would be subject to immediate confiscation since it would be assumed to be stolen government property. Now available is this modern over-strike, the most exacting and faithful rendition available. Holding one in hand gives the viewer a true sense of what it would be like to own an original (had any actually been issued). 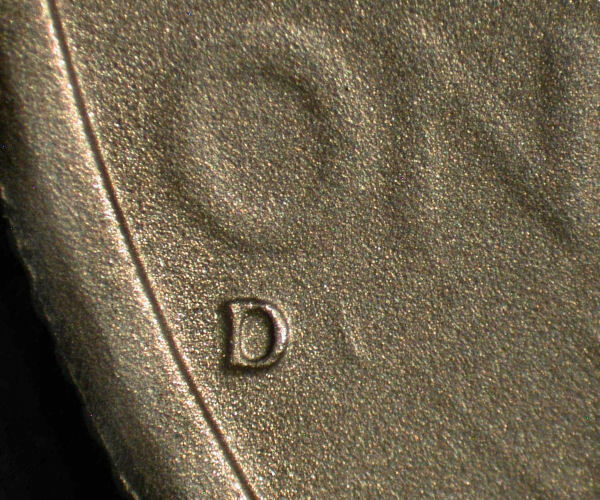 And since these are over-struck on genuine coins, they have the correct weight (no metal is added or removed), correct metallic content, and correct diameter and edge type. All the over-strikes are privately and painstakingly performed using a surplus Denver Mint coin press.